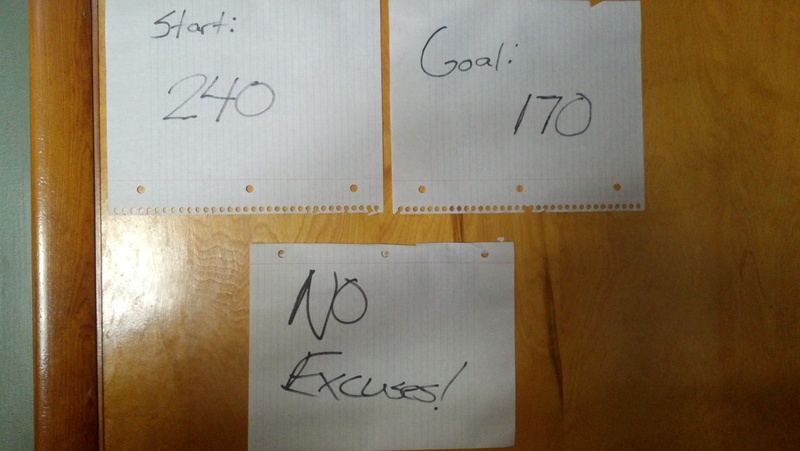 How I Lost 60 Pounds in 4 Months (And the ‘you can too!’….. cliche)! Towards the end of 2012, a point had come to where I needed to think of a resolution to make for 2013. In years past, I had given up things like chocolate (ugh! ), video games (double ugh, and ranks high on all time WORST choices ever! ), and being less of a night owl. Since I didn’t want to recycle an idea, I decided that losing weight was a good resolution for the new year, especially after not being too concerned about my level of diet and/or exercise for a while. The clothes were getting a bit tight, and I figured I had put on a few pounds since my low of 185 back in 2011. I thought, “I’m probably at 205, 210 tops. 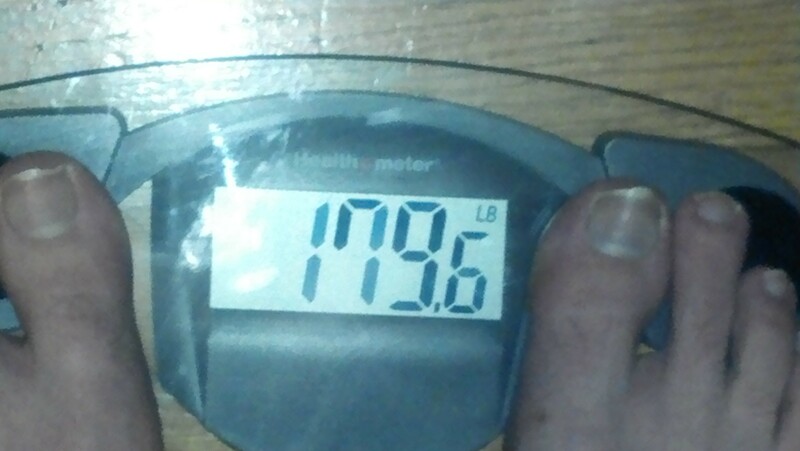 And 20 pounds should be a good milestone for the year”. And to great dismay, I got on the scale at the beginning of January and saw that I was not only well above 205, but clocking in at 240 (up 55 pounds in a year and a half!)! Talk about letting yourself go and catching it before it really got bad. Goals and expectations dramatically changed, and off I began with the resolution immediately. Set the bar high, and in a place where you will see it every day! Much maligned at my situation, I decided that 20 pounds was no longer an acceptable goal and moved it up to 70 pounds(!). It was a tall and daunting task ahead, but it needed to be approached head on, for my own health. In addition, I had set the bar also extremely high by having the timetable set at Mother’s Day for when I would have liked to hit that goal. Along the way, it was important to set sub-goals for myself sop that I did not get burned out or discouraged along the way, and in addition, ever time I hit a goal marker, I rewarded myself with an extra cheat day during the week. It made each goal more manageable, and didn’t feel like I had to morph into a ferret and eat flax seed around the clock, because really, FLAX SEED. Your goals may be much different, and its important to not push it too hard so that your body can build up stamina for when you hit the final stretch of your goal. You can set your timetable to as long as you want if you casually want to approach your objective, or short if, and only if, you know your body can handle the grueling pace. Foremost, its a necessity to listen to this song and watch the video, because nobody is more of a badass than Christopher Walken. There are many different avenues to travel down if you are adamant above improving your physical well being and appearance. Some people like weights for toning, some people do swimming, other still routines visits to the gym for a mix of cardio and weights. Myself, I am a big fan of the treadmill and marathon style endurance training. I found this to be the best for pushing your heart rate to 85-90% of its maximum. By doing this, it allows your body to more rapidly enter weight loss by burning fat cells instead of excess calories or carbohydrates. – What is Marathon Style Training? Marathon Style training involves frequently shifting from brisk walking to either jogging or running, and then back. Depending on how intense your program may be, if you are fond of treadmilling, you can cycle this for up to 1 hour at a time for less intensive sessions, or as short as 25-30 minutes for more intense sessions. I started with a walking pace of 3.5 mph, which is slightly above normal walk speed, and a jogging speed of 7 mph. 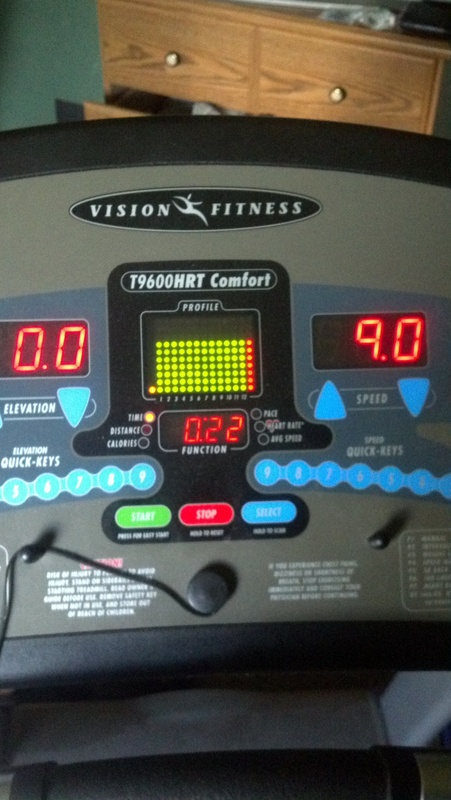 Unfortunately, my condition was at a point where I had to hold on to the machine while running at first, so I was not getting the full effect of the run intervals. Alas, it it still better than nothing while stamina and tolerance build up.Gradually, not only will your ability to improve push you to increase your walk and run speeds, but there will be multiple parts in the run where your body will feel GOOD while you run. Approaching each day with the mindset of pushing to do just slightly better than the day before, also greatly enhances your capacity to improve, daily! – How long should I run for (and how many times a day?)? That is really up to you and what you feel you can best handle. A general rule of thumb to follow is that, if your (in this case legs) hurt, your chest hurts, or you have a tough time breathing/or light headed, stop immediately. Otherwise, twice a day up to one hour total, has been my limit. Its important to note that when you exercise is up to you. I found that running at night worked better for me, because it kept metabolism levels (to burn energy) up when it usually starts to decreases before one goes to sleep. Do you feel the need….. for speed? The dreaded make-or-break in some cases. Its not as severe as a lot of people make it out to be. Much like, what type of exercise is best for you, there’s also area-centric diets as well. Muscle building goes for high calorie, high protein diets with high activity, tone goes for low carbohydrate, high calorie, moderate activity diets, usually due to not having enough time to exercise as often as they would like, and weight loss specific diets shoot for low calorie, low fat, high activity to produce close to instant results. This diet focused on counting calories, while fat and carbohydrates were not much concern to keep track of, keeping a good level of fiber and protein in the regiment helped bolster results. A lot of nutrional fact labels have breakdowns for 2,000 and 2,500 calorie diets, and those were just a bit much for my liking, as I shot for around 1,400 calories every day, once I broke into a rut of what I wanted to eat. This is enough (for me), to be able to do my job, exercise and stay focused comfortably, your level might be different depending on body size, sugar levels, etc. No lie. Option C has become kryptonite. Every time I go shopping I get the maximum amount of the product I can per trip. SERIOUSLY. SO GOOD. Option C: 1 Can Campbell’s Chunky Soup (Flavors Vary, 270-410 Cal per Can) + 4 Toast Points (70-150 Cal, varies on bread thickness). 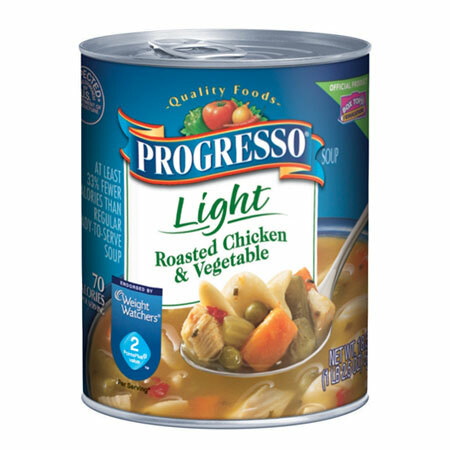 Ive found the crustless chicken pot pie steamer to be really good for a TV dinner-esque product, as well as the Spicy Sausage Gumbo for Chunky Soup (sucker for spice), there are some flavorful, yet low cal options at your disposal. Option HELL YEAH LETS EAT: 3 Eggs, Scrambled (210 Cal) + 1 Potato (cubed and steamed to soften) (95 cal) + 1 bell pepper (diced, 65 cal) + 2 Links Hot or Sweet Italian Sausage (170-240 cal). Combines all these is a pan with a little garlic (0 Cal), crushed red pepper (0 Cal), and olive oil (50 cal), and you’ve got yourself a party for dinner for under 600 calories! When you get to whatever days you decide to be cheat days, have whatever you want. Your body will thank you, not only in having initial gratification of having something you long for, but going for too many days in a row where you restrict the amount of calories/sugars you intake can send your body into a miniature starvation mode where it will hold onto sugars consumed and burn up proteins and carbohydrates instead. Yep, a frozen tv dinner health product. 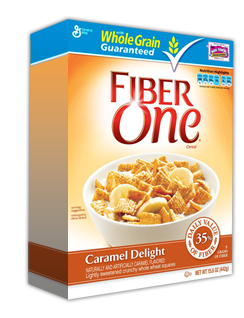 Amazingly good for a high fiber product, well worth $3 a box. Lacks salt, but being 90 calories will make up for the flavor loss. *Do the background research on all supplements before rushing out to get something that may do more harm than good, sometimes irreversible. * Having always had a very weak metabolism since I was a child, exercise alone was not enough to stimulate the pituitary and adrenaline to kick the thyroid into top gear. So I needed something that could assist with that and keep it elevated during times I was not engaged in activity, being it working out, work, or other hobbies. My parents had received a sample of a product called Oxy Elite in a goodie bag from a wedding they attended and said for the limited amount they were given, seemed to give an extra boost of adrenaline and energy. 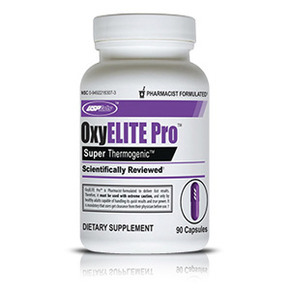 After looking at the tests and effects of oxy elite, I purchased the Oxy Elite Pro 90 Capsule supplement. This product works great for me, however the one side effect it has that I have noticed is cause your temper to shorten, I would avoid using it, if something stressful is happening within the next 6-12 hours. Another product that caught my eye, was the highly marketed and hyped Raspberry Ketone. These pills are designed to target fat calls and shrink them, reducing fat and the amount of fat that can grow back into them. I gave these pills a shot, and while I did not notice any side effects from them, the results of one bottle weren’t nearly as felt as the oxy elite. My torso felt a bit tighter on the whole compared to a bulge at one point, but Im not rocking really ripped abs or anything close to that. If Zerglings can gain a Metabolic Boost, I can too, Damnit! Breaking my previous all time low by 6 pounds! While it is not my goal, it gives me a great sense of accomplishment about what anyone can do with focus and determination. And it also brings on the last run of my goal. Your goals are attainable! Believe you can get there, and fight for an extra 3 minutes on your machine, or the urge to give in to a double baconator deluxe with the works and it will all add up in the end to making you one healthier, and happier, person! If you follow any of this advice, I hope it works out for the best for you!